Three Pipe Problem: Google Art Project : a bold step into the future of art history? Google Art Project : a bold step into the future of art history? Today was a special day in web history! Whilst I had heard snippets of information in recent months, I was truly suprised and delighted to learn that Google Art Project went live today. What is Google Art Project? If you're familiar with Google Maps, Google Art Project is similar to it in some ways. Instead of navigating streets however, you navigate famous galleries and museums of the world. In many instances you get to go into deep zoom on some remarkable high resolution images, which from what I have seen so far are watermark free. I hope this encourages other high definition imaging services to follow suit - such as haltadefinizione.com. One of the benefits of the interface is that you can log in with a Google account and create a customised art collection. Google has been working closely with partner museums, actively digitising their collections. It is a great step forward to realising the dream of making the world's art treasures accessible to everyone with Internet access, which according to recent figures released by the UN, are over 2 billion people worldwide. Madrid is quite far away, so it was an absolute delight to finally view Carpaccio's enigmatic work in crisp detail! Art is not just about aesthetics and bolstering one's investment portfolio. To many, art is about the power of ideas, and the ability of ideas to enhance one's appreciation of the world and of human endeavour. You do NOT need to spend thousands of dollars travelling, standing in queues and clomping along on a tour to do this. Now you can get online, and use your own eyes to see works in degree of detail is is simply impossible to do when you see them in person. Included alongside the images can be notes and related videos explaining the composition. Whilst this is not of course included for every image, many of the famous pieces do already have this at launch. For a nice visual summary of what the project can do - here is a video from Google Art Project's YouTube Channel. Bravo to Google, and the museums involved. I sincerely hope the educators among us take heed of this amazing new resource Google has placed in their lap. I'll be keeping abreast of innovations to the project and will post about them here - including tips and tricks as I come across them. The list of museums presently included are quite impressive, though notably missing for me are The Louvre and The National Gallery Washington. I hope they get incorporated in the future. Below is a list of the museums included at launch. 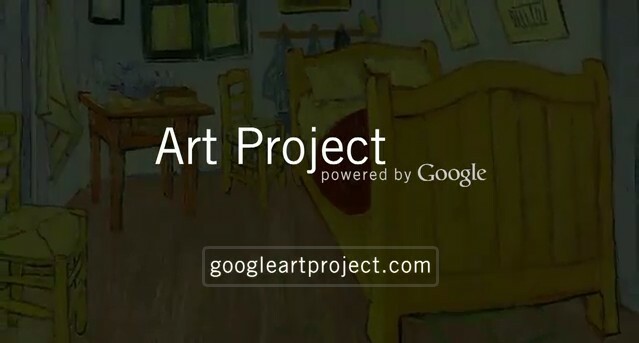 If you haven't done so yet, go have a look and play at Google Art Project now! Many thanks for the heads up on the Google Art project. I've already started to build my portfolio. Just an aside on the Bellini Stigmata closeup you provide above. I've stood right in front of the painting many times and it is hard to see. Bellini obviously downplayed the Stigmata or regarded it as something that had happened earlier in the life of the saint. But what about the impossible position of the two little fingers on his right hand! Try and twist your fingers into that position. How exciting! I've had multiple people email me today, asking if I've heard about this project - but I'd like you to know that I first found out about it through your blog! I'm really excited to build up my personal portfolio. This is going to be a great resource for educators and students. @Frank! The ability to create a custom portfolio is fabulous! I can definitely see myself 'curating' some collections of favourite artists. I sincerely hope galleries in Venice and Rome are included in the not too distant future. It's interesting to note the Prado in Madrid is not included, as Google had a virtual visit including gigapixel images of over a dozen works built into Google Earth. Hopefully they will incorporate that as well. @M! This definitely was a lightning post! I started it almost immediately after I learnt about the project. That's the beauty of online publishing. I'd be interested to hear about how you end up incorporating this new resource into your teaching. 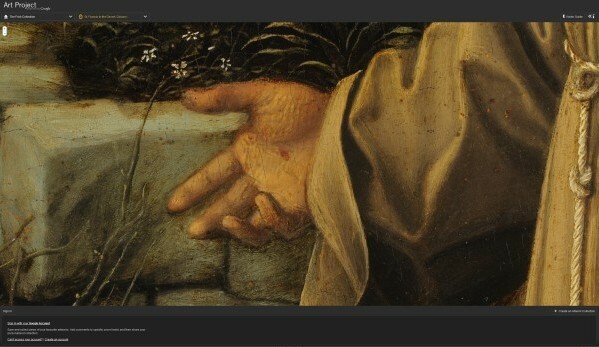 @Ben - I'm viewing the Google Art Project on a 30" display at 2500x1600.... it looks/scales phenomenally! Seeing the works on line doesn't replace viewing the works in situ - you cannot get a sense of size, location and depth from a screen. But as a first step to examining what art is out there, over a wide geographical range of galleries, The Art Project will be invaluable. I wish I had this when I was writing my own thesis. I'm pushed for time at the moment- but have had a quick look. Great development. This is really excellent and I appreciate that you spelled it out for non-techie, non-art-historian art lovers! It's incredible - I love the zoom feature - this is the first time I've ever noticed the crucifix in the top left corner of the Ambassadors. Check out the detail on the globe though! @Ben - The Ambassadors is a great piece to go hunting around for symbols you may not notice in an in situ viewing. I must admit though, I'm a tiny bit sad the Arnolfini Portrait is not in The National Gallery London's selection... I hope they include it at some point in future. 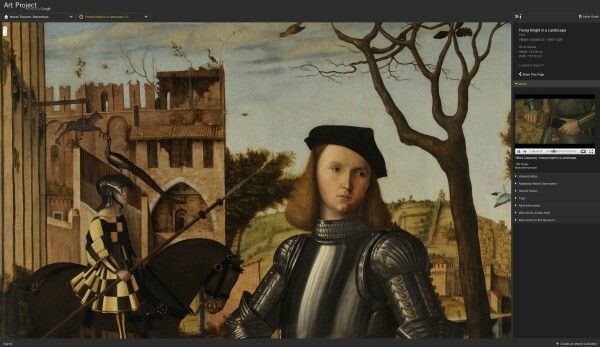 Van Eyck and a gigapixel render are a match made in heaven. How can I download the link like Google Earth so I can go to it via a APP or Icon? Hello James - the GAP isnt really designed for offline use and the interface not optimised for mobile devices. The closest you can get to an app/icon is to use Google Chrome which has a launchable chrome web store app - it's simply a shortcut to the site (which you can essentially replicate with any browser).